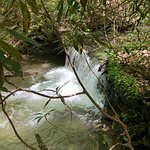 Take a naturalist's ramble off the beaten path to explore a hidden world of charming small Appalachian Mountain waterfalls. We will visit several along an un-maintained trail through old farm fields. 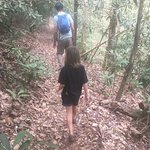 Meet a naturalist guide at the Greenbrier entrance to Great Smoky Mountains National Park (directions listed in your voucher) for a 3-hour walk in the woods. This moderately strenuous hike follows an Appalachian mountain path to several small waterfalls and cascades. You’ll rock-hop across streams and crest narrow ridges, then be rewarded by the sight of gorgeous cascades shrouded in lush greenery. Enjoy the intimacy of hiking with a small group. Get away from the crowds on this lovely excursion through an old homestead site. Experience the peace of a babbling brook as you visit a series of small, pristine waterfalls. Learn about the Settlers who used to call these mountains home. Excellent hike with Ken! Ken had a lot of knowledge to share with the group, and got us pretty close to some pretty waterfalls. So happy you enjoyed your walk in the woods! Erik Soltan had a fabulous time with your group! We hope to see you again to take you on another adventure. Get quick answers from Great Smoky Mountains Waterfall Adventure staff and past visitors. What time does this tour start and end please? Is it a circular route?